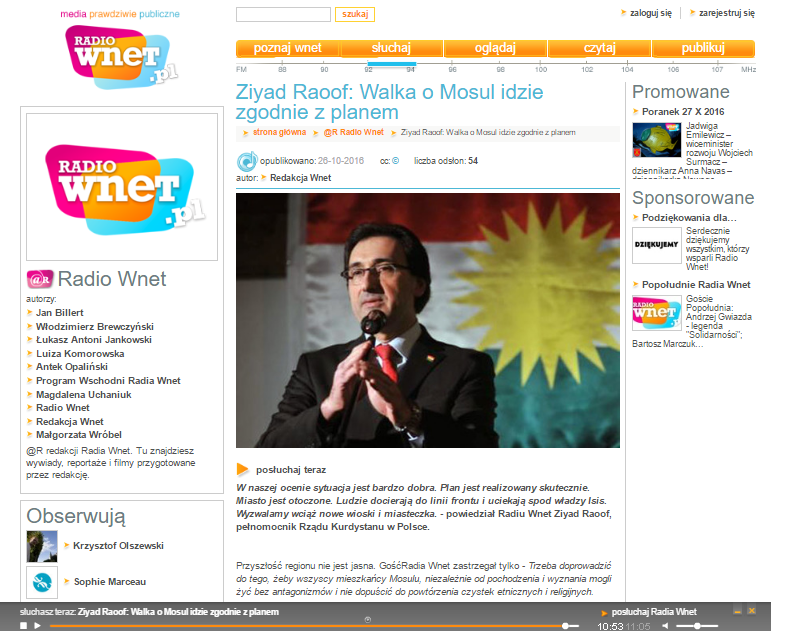 We would like to invite you to listen to the interview with Ziyad Raoof, KRG Representative in Poland which took place on October 26, 2016. The starting point for the discussions was a military operation of retaking Mosul. Ziyad Raoof said that in the KRG opinion, “the situation is very good. The plan is implemented effectively. The city is surrounded. People are coming to the front line and flee from ISIS. We still liberate new villages and towns”. He pointed out that it is very important what will happen with the city after the operation “All inhabitants of Mosul, regardless of their origin and religion should be able to live without antagonisms. And everything should be done to prevent such ethnic cleansing and religious to be ever repeated”. Ziyad Raoof also presented the current situation in the Kurdistan Region.